Da Nang – The City of Bridges is such a charming destination of Central Vietnam. Due to its close location to three cultural world heritages – Hue Imperial City, My Son Sanctuary and Hoi Can Ancient Town, Da Nang city makes a great base to discover all the wonders of the central part of Vietnam. 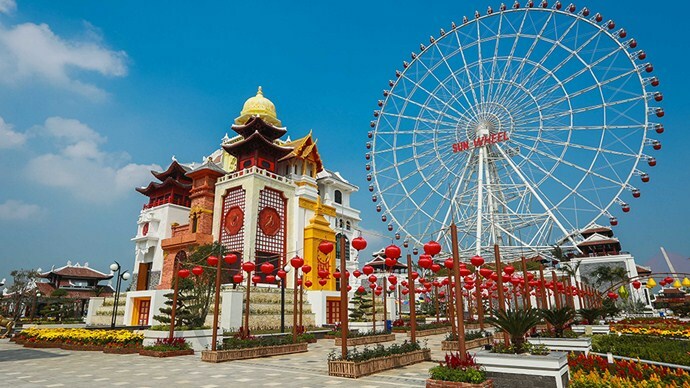 Once you are in the city of Da Nang, you can’t help to be attracted by the gentle, white sandy coastline, the colorful, impressive bridges and spectacular mountaintops and more. Here is your ultimate list of the top things to do in Da Nang. The thing Da Nang is most famous about is its collection of bridges. The bridges in Da Nang are so creative and iconic to the point that every time the city build a new bridge, it becomes trendy. After the Dragon Bridge and Love Bridge, the newest sensation that has gone worldwide recently is Golden Bridge, boasting a mind-blowing architecture. 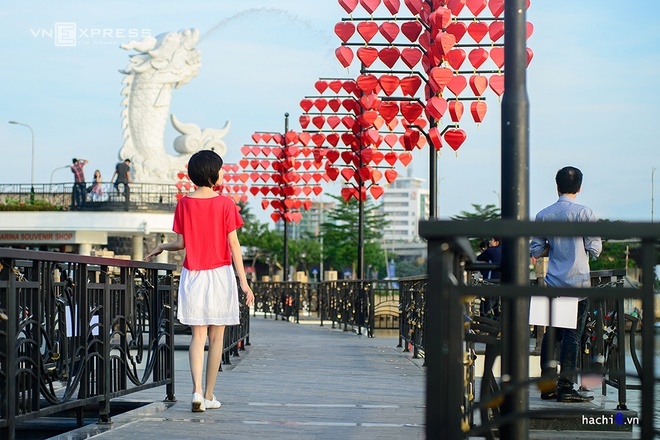 Welcome to the romantic side of Da Nang – a bridge that is dedicated to all the couples. Built in 2015 on Tran Hung Dao Street which is just perfect location to watch Dragon Bridge, sunset and fireworks. The bridge is 70m long, inspired by many love bridges across the world where lovers share their moments together. Right at the bridge is the statue of Carp Turns into A Dragon representing virtues like patience, dedication and determination in Asian culture. This bridge was opened for traffic in 2013, became the 7th bridge in Da Nang over Han River. The bridge became a trend right away for its dragon-like appearance and its special feature of breathing water and fire through its mouth on every Sunday at 9:00PM. Come to the riverside at night to see the bridge light up across Han River. This bridge is absolutely the number-one thing to do in Da Nang. This should be the highlight of 2018 – the whole world was amazed by this newly built bridge which has already drawn so much attention and praises. 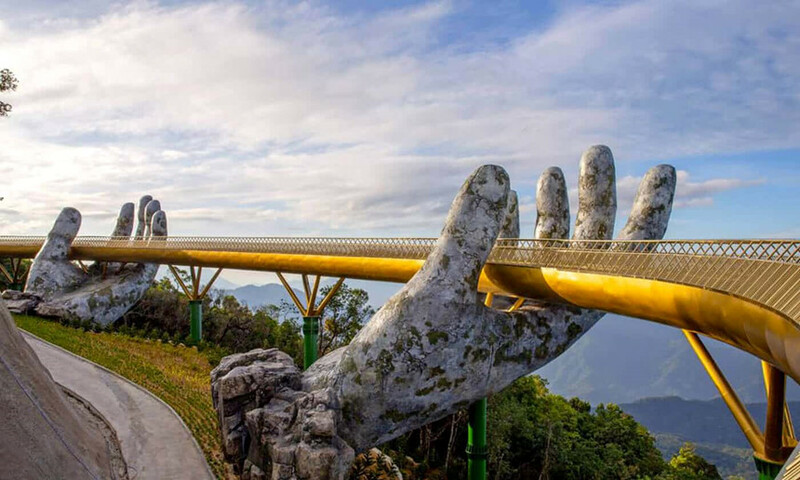 Located in Ba Na Hills, Golden Bridge boasts with an impressive architecture – two giant stone hands emerging from the mountain and holding the delicate gilded bridge. With the magnificent backdrop view from the height of 1400m, this construction is even more outstanding. Adorned by lavenders and chrysanthemums, Golden Bridge is a dreamlike walkway for posing. 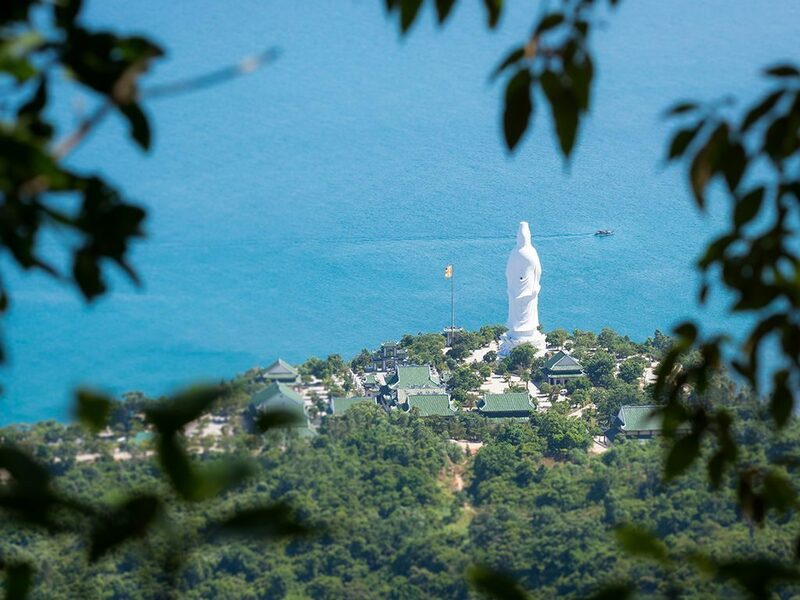 Featured a giant standing statue of Guan Yin looking over the sea, Linh Ung Pagoda on Son Tra peninsula is a perfect site for cultural exploring and sightseeing at the same time, especially at night, from the pagoda you can see Da Nang lit up with the colorful city lights. To the locals, this pagoda is such a blessing because since built, it seemed that the hurricane season was less severe than before. 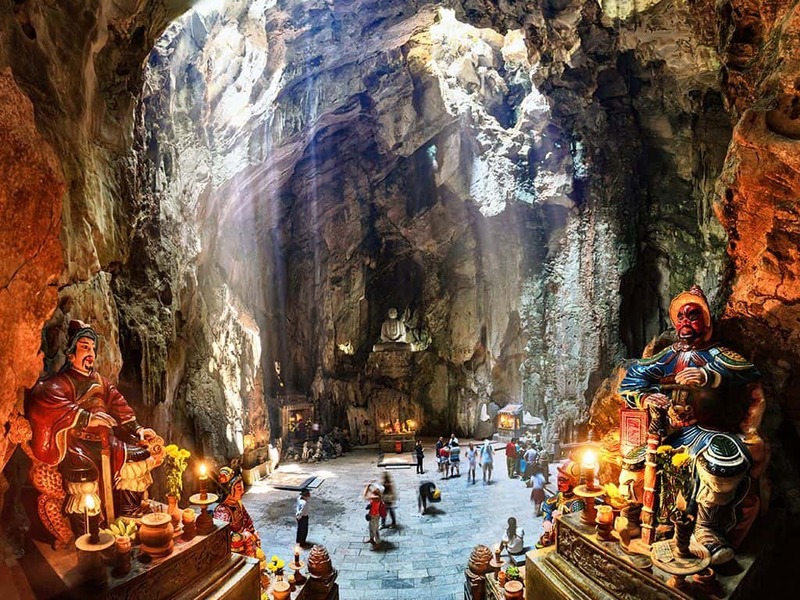 Located only 7km from the centre of Da Nang city, Ngu Hanh Son (Marble Mountains) include 5 mountains according to Wu Xing (Five Elements in Chinese culture) that are Kim, Moc, Thuy, Hoa, Tho mountains. Ngu Hanh Son is a total package with breathtaking views on the top, beautiful caves – Huyen Khong, Van Khong, Van Nguyet, sacred pagoda – Tham Thai, natural stream Giai Oan and Non Nuoc village at the base of the mountain. 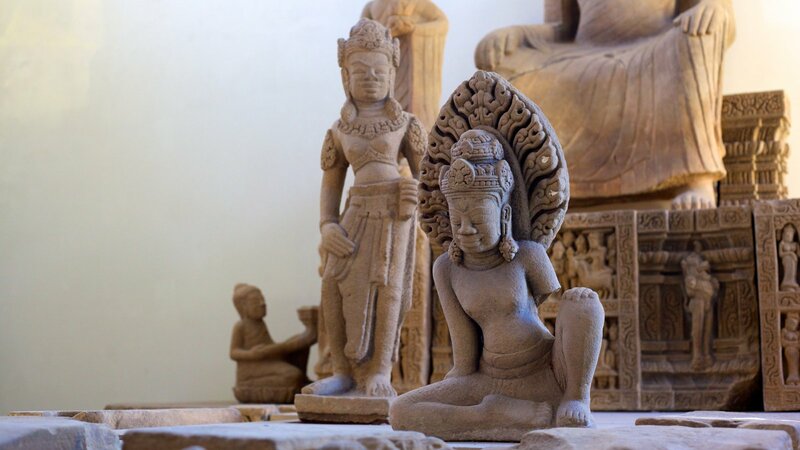 Ngu Hanh Son is also known for stone carving handicraft. *Tip: you can join Guan Tin festival held at Ngu Hanh Son during 18th – 20th days of the second lunar month. Activities: procession of Guan Yin statue, floating flower lights on the river and other philanthropic activities. Untouched by tourism, Cu Lao Cham is a wonderful getaway from the city life. You’ll be charmed with the turquoise, clean water color surrounding the island. The wildlife on Cu Lao Cham is fantastic for adventure with primitive landscapes. Don’t forget visiting the fishing village to enjoy the peaceful atmosphere here and the delicious seafood. Come to Cu Lao Cham, you can have the whole beach for yourself where you can enjoy swimming, sailing and scuba diving. 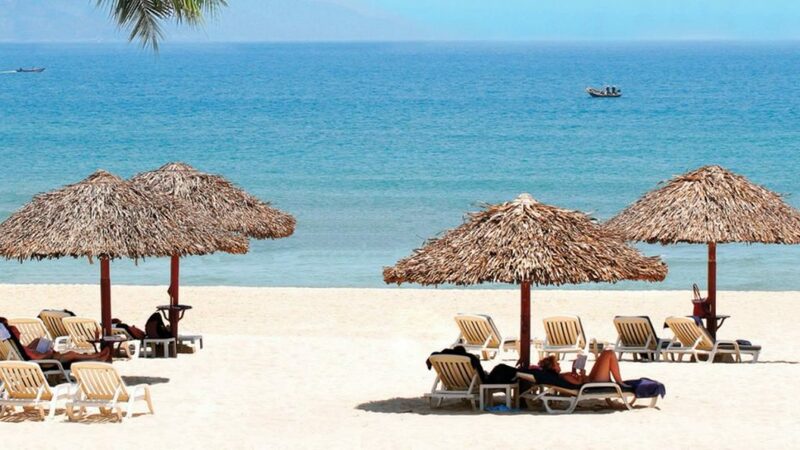 If Cu Lao Cham is too far for you, My Khe is another excellent choice for your beach break. With length of 900 meters, My Khe boasts a white sandy beach and blue sea water running along the city’s road AND cleanliness which is a huge score for a beach in Vietnam. Come to My Khe to enjoy swimming, surfing and other beachside activities. A wide range of restaurants and hotels along the coastline offers plenty options and services for your trip. Other than seeing the Golden Bridge, Ba Na Hills is also the place to have fun and enjoy romantic French architecture. 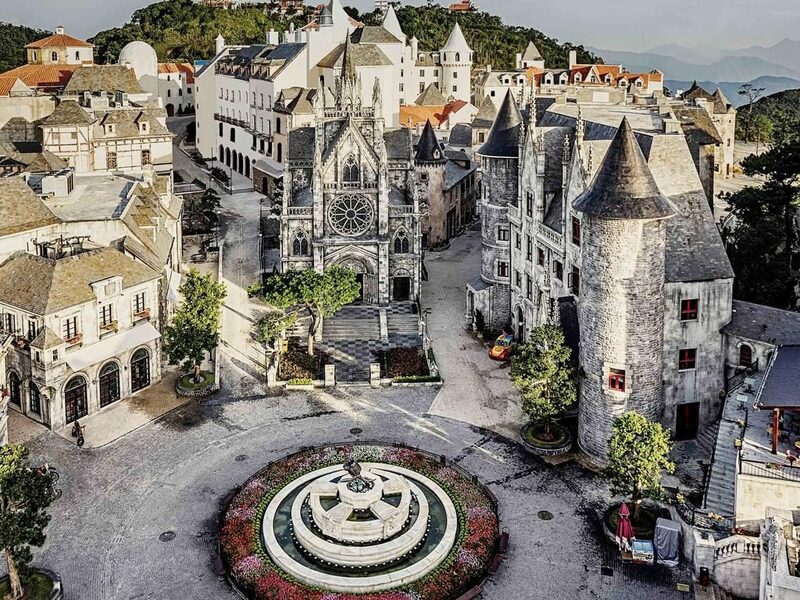 Located 40km southwest of the city centre, Ba Na Hills take you about 30 minutes traveling. The complex, only accessible by cable cars, features a range of gardens, French village, Wax Museum, Le Jardin D’Amour. 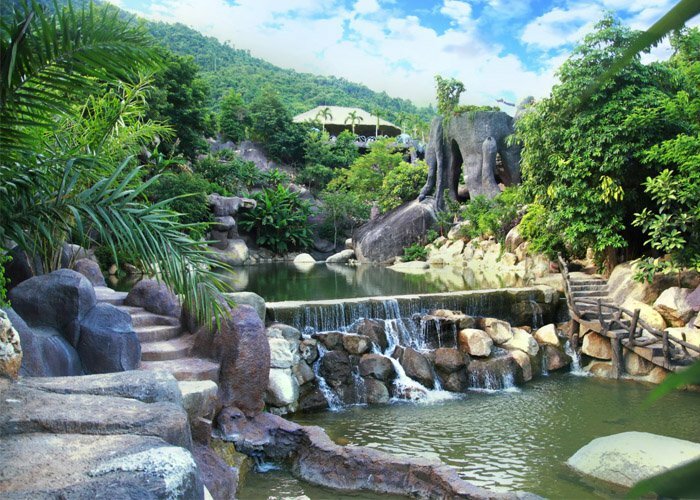 Than Tai Hot Spring is a wonderful place to take your kids and family to enjoy the landscape and of course, bathing time in such fairy tale like setting. The water would definitely relieve you from muscle ache and stress. There’s also a Japanese onsen site in the complex which is pretty similar to one in Japan. Take your kids to the complex’s water park, they’ll absolutely love it. 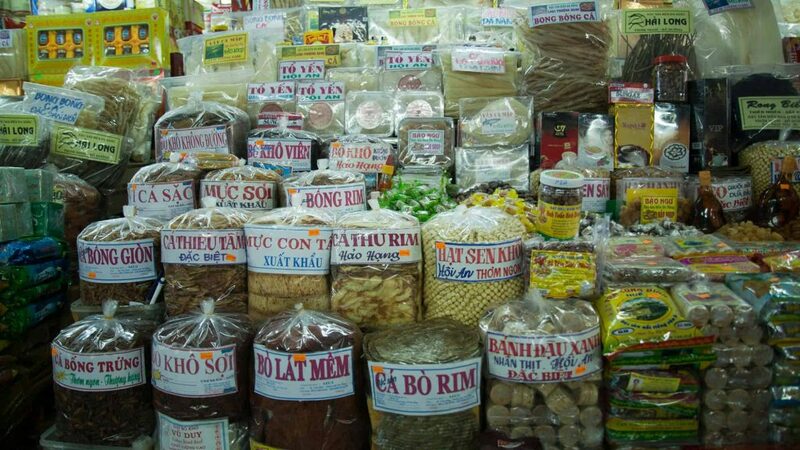 If you're finding a place to shop and enjoy Da Nang cuisine, Han Market is your top choice. The market has been in operation since the French occupation in 1940s, caters all kinds of products to both locals and tourists who come to Da Nang. Han Market has two floors, is located on at the grand intersection of Tran Phu Street, Bach Dang Street, Hung Vuong Street and Tran Hung Dao Street. Inside the market, you can find as many types of products as you can, including clothes, dried foodstuff, extract oils, household products, etc. The market's food court is the paradise of Vietnamese dishes like mi quang (Vietnamese turmeric noodles) and com tam (broken rice) to banh xeo (sizzling pancake) and goi cuon (Vietnamese spring rolls), each of which should cost you no more than VND 30,000. The Museum of Cham Sculpture deserves to be one of the best things to do in Da Nang for its uniqueness and spectacular exhibition. Housing the largest exhibition of Cham sculpture in the world, the museum displays almost 300 terracotta and stone works of art ranging from the 7th to the 15th centuries, and many of them are considered the masterpieces of Cham sculpture. Da Nang is only 18km away from Hoi An which is one of the best destinations of Vietnam. You can get from Danang to Hoi An so easily by local buses or taxi or motorbike. 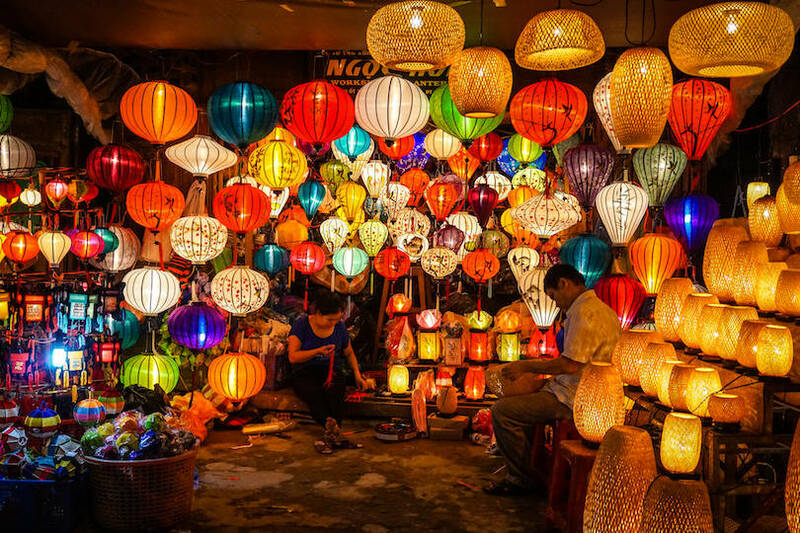 As the top destination in Vietnam, Hoian offers a wide range of things to do and an active nightlife. Hue has an irresistible charms of the last pseudo-capital of Vietnam, shines with the lights of the old time. Located just over 90 kilometers northwest of Da Nang, Hue makes a wonderful day trip with gorgeous landscapes along the way. Come to Hue, don't just visit the imperial citadel only, remember to enjoy the unique and delicious cuisine of Hue. Located just 40km south of Da Nang, My Son is another world's heritage to visit besides other two heritages Hoian and Hue. My Son is a cluster of cluster of abandoned and partially ruined Hindu temples in Vietnam, constructed between the 4th and the 14th century AD by the kings of Champa. The complex was designated as a UNESCO's protected world's cultural heritage in 1999. Da Nang with its world class golf courses is drawing golfers from all over the world. The four main Golf courses are sprawled from north to south of the city on white sandy beaches. Da Nang Golf Club is opened in 2010 and has been placed among the 15 best new golf courses in the world by USA golf magazine. The golf course not only provides the best golfing experience but due to its central location it is also great for going out on an expedition after the game. The world-class amenities, great hospitality and amazing food make it a hotspot of Asia’s golf destination. Another choice for luxury golf course near Da Nang is Ba Na Hills Golf Club, set at the foothills and native forests offering an impressive backdrop for your golf experience. Da Nang is a great place to travel for food where the fusion of northern cuisine and southern cuisine really shines. The best dishes in Da Nang feature meat cuts, paper rolls with herbs, noodle soups to many other cheap options of snacks. 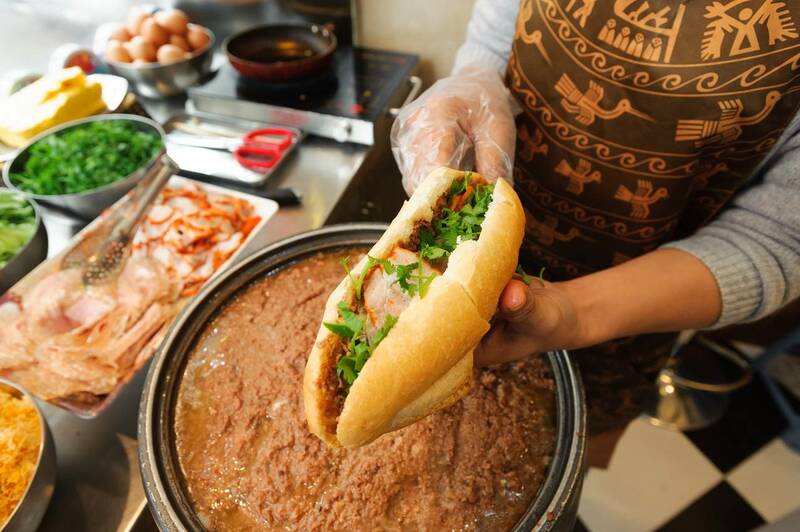 Banh Mi in Da Nang also has a distinctive style compared to banh mi in other regions. 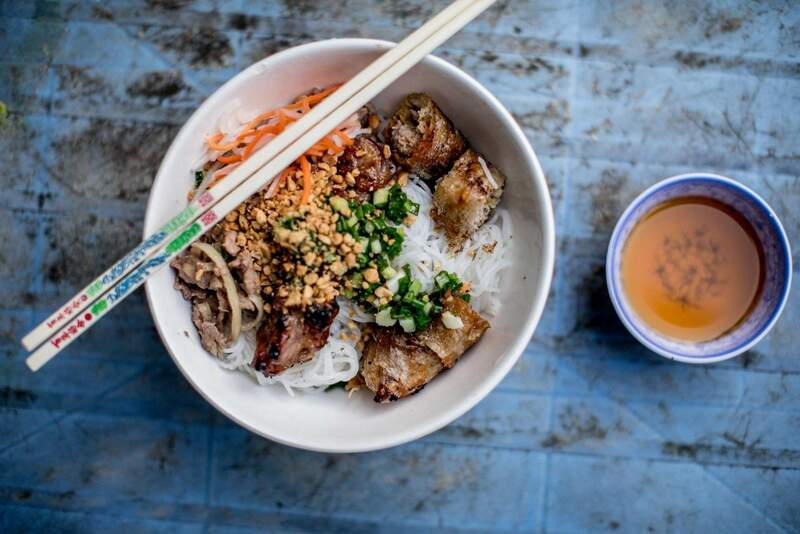 The one specialty we can't miss when talking about what are the best food to try in Da Nang is Bun Thit Nuong (Vermicelli Noodles With Grilled Pork). Mi Quang in Da Nang also a great dish and you can compare to Mi Quang in Hoian to what is the difference. You can get to Da Nang from major cities like Hanoi and Ho Chi Minh City by airplanes, trains and buses. Da Nang International Airport is located in the heart of Da Nang City. Flights from other cities to Da Nang are available with 3 main airlines while international flights are mostly from Asian countries. 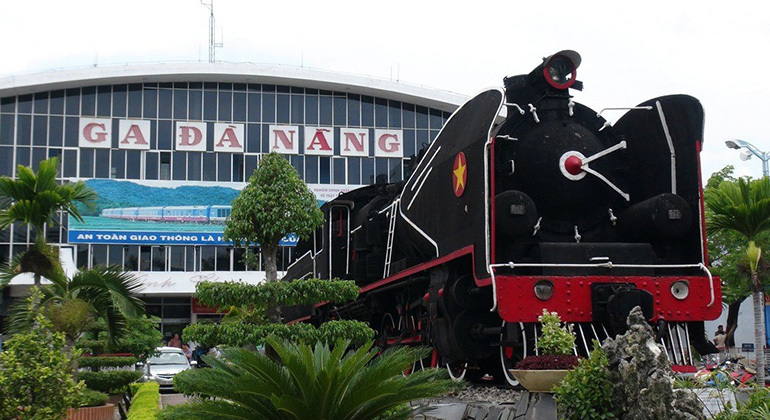 Da Nang Railway Station is located on Hai Phong Street which is about 5km away from the city centre. Good news is you can book tickets online on the website of Vietnam Railway. You can also book tickets through hotels and guesthouses with a commission charge (about 20,000VND). For closer destinations, hard seats should be good enough. However, you totally should go with soft seats for longer journeys. If you go up north to Hue, you will have the chance to see the marvelous Lang Co Bay. Da Nang Central Bus Station is located on Dien Bien Phu Street. As a common knowledge, you should beware of the traffic around any bus station in Vietnam. Buses from north and south Vietnam come and go from/to this station all day everyday, making it every busy bus station. Thanks for the many buses available, you don’t have to book ahead. Bus ticket to Hue is 70,000VND (standard) and 108,000VND (2nd class). There are also buses to Laos cities: Pakse (daily at 6:30), Savannakhet (Mon, Wed, Sun at 19:30), Tha Khaek (Tue, Thu at 5:00) and Vientiane (Mon – Sat at 14:00 and 15:30). Danang has a tropical monsoon climate with high temperatures and less fluctuation. Due to its location in the middle of Vietnam, the climate is also influenced by subtropical climate in the North and the tropical climate of the South. Thus, Danang is divided into the rainy season (August to December) and the dry season (February to July). The best time to visit Da Nang to enjoy activities like trekking and beachside activities is the dry season. You should avoid the stormy season from November to January if you are visiting Da Nang for this purpose. 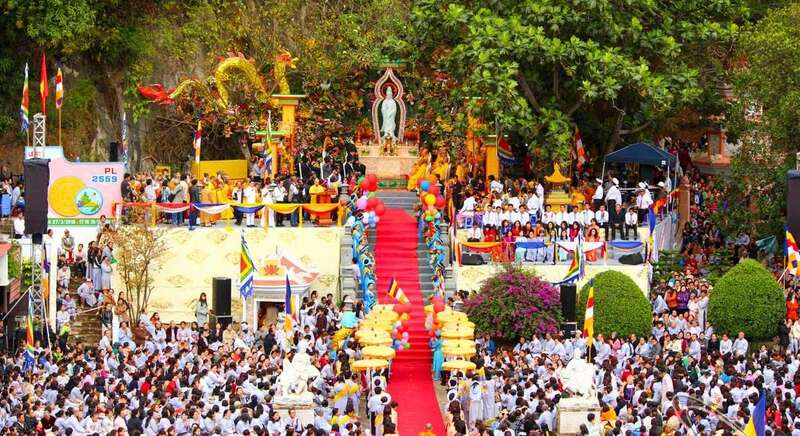 This festival honors Avalokitesvara with the main event of Avalokitesvara Bodhisattva statue procession held on the morning of the 19th day. Other rituals include flower offering ceremony, sutra chanting, ceremony of giving alms to wandering souls. The actual festival has activities like camping, boat race, art performance, and many other cultural activities. This festival is one of the most important events for fishermen, taking place every year on two days in middle of 3rd lunar month at the coastal villages in Da Nang. This is the time for the humans to thank the whales who are believed as sea gods, protecting the boats out on ocean and bringing prosperity to the villages. 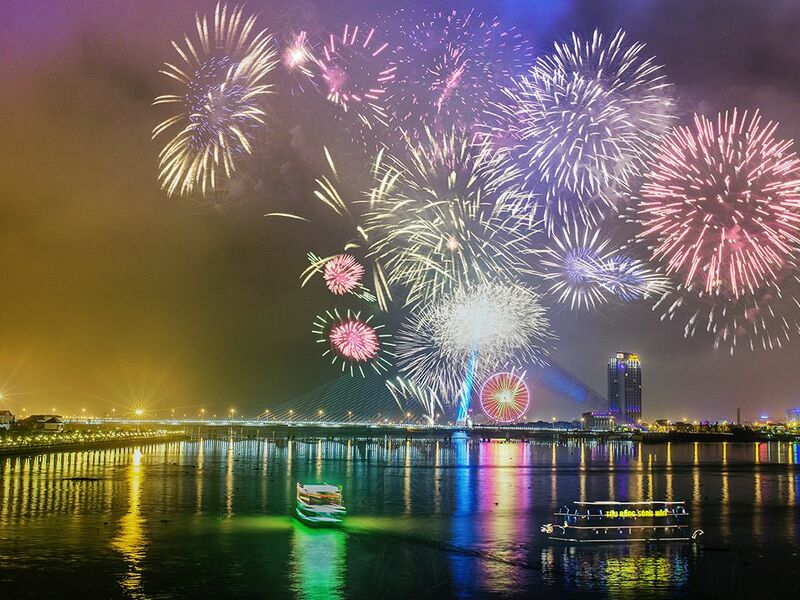 Every year, Da Nang holds an international firework competition gathering a many international teams to perform colorful firework with light effects and background music. There're also many auxiliary activities besides just watching fireworks such as light festival, parachuting contest, cuisine festival and international art festival, etc.